My father told me that once there was a British Officer during the 1920's who went out hunting. This Englishman had travel to all corners of the British Empire and he loves shooting animals. One day, he spotted a monkey, and carefully he aimed his gun at the primate. That monkey didn't run or acted aggressively. Instead, it just cover its eyes with its hand. The hunter almost squeezed the trigger, but slowly he dropped his gun and moved away. According to my father, that person had forbade himself to shoot another animal from that day onward. That was the Proboscis Monkey. Sometime it is call the Long Nosed Monkey, because of its big nose. The Indonesian call them Monyet Belanda (Dutch Monkey) a remark they made to describe their Dutch Colonizers. Some scientists believed the big nose is for attracting females or for intimidating rival males. Their habitat is usually along the rivers and mangrove swarms and they can only be found in Borneo. Proboscis are considered endangered species and for decades the Sabah (North Borneo) Wildlife Department had made tremendous efforts to protect them. Among their methods is to introduce them to new habitats all over Sabah. Pulau Gaya (Tengku Abdul Rahman) National Park is fortunate to be one of them. Proboscis have webbed feet and hands and therefore a good swimmers, good enough for them to escape from predators like crocodiles. 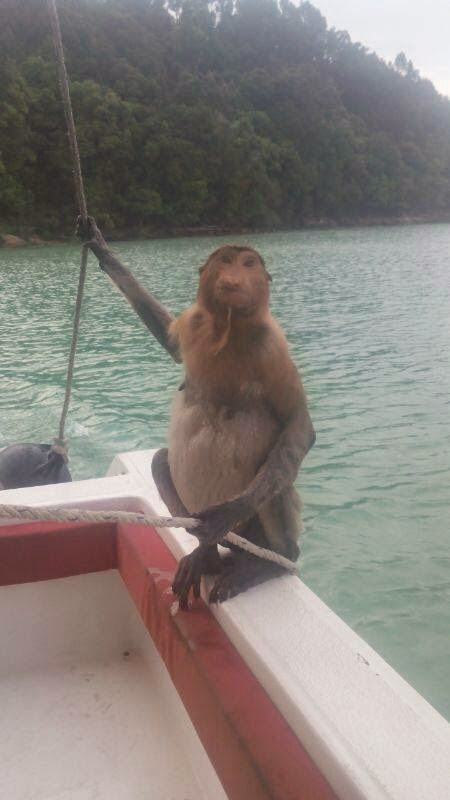 Another touching story is about a Proboscis being attacked by a group of macaque monkeys in Pulau Gaya. Macaque is well known to be highly unpredictable and aggressive, even those that are kept as pets. Proboscis are so gentle preferring to mind their own business and staying out of trouble. The proboscis jump into the sea and try to seek refuge anywhere. She was fortunate to bump into Chris Lammert. Chris threw a rope towards her and immediately she knew she is going to be help. She accepted and Chris pulled her into the boat. She was shivering, and Chris wrapped her with a towel. All the way she accepted the gesture offered by Chris and just kept quiet. She knew someone kind is helping her. 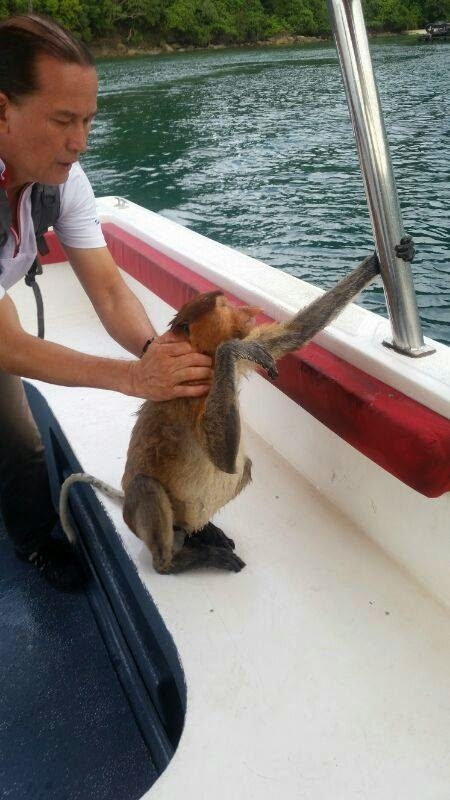 When the monkey dried up, Chris brought her back to the mangrove at the Park nearby. As Chris departed, the monkey stayed as if it understood and say thank you. Only when Chris is far away, the monkey disappeared into the forest. On the left picture, the monkey was just saved and still holding the rope. On the right, Chris tried to console her as she was still unsure but few minutes later she was very comfortable and relax. Pulau Gaya is a 20 minute boat ride away from Jesselton (Kota Kinabalu). Very totful of Chris....nice story on our orang putih monkey!